Click here for a complete list of performances at the Ramsdell Theater and other venues. For anyone interested in historical architecture, the Ramsdell Theatre in Manistee is one of Michigan's great landmarks. Opening in 1903, it was named after local lawyer and entrepreneur Thomas Jefferson Ramsdell. He was instrumental in the growth of Manistee, opening the first hardware store, helping produce the first newspaper, and founding 1st National Bank. Ramsdell wanted to bring culture to Manistee, and after the Scandinavian Opera House burned, he donated $100,000 of his own money to create what is now at the corner of 1st and Maple streets. Throughout the years, the Ramsdell Theatre has gone through many changes. Many plays were performed in the early 1900s, followed by movies. The theater portion was closed in 1930, and reopened in 1936 to show first-run movies. 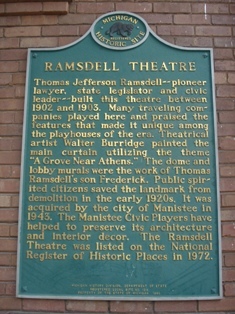 The Manistee Civic Players were formed in 1939 and used the Ramsdell for their productions. Restorations were performed in the late 1940s to early 1950s. Famous actor James Earl Jones, then known as Todd Jones, started at the Ramsdell as a stage carpenter, and later portrayed Othello in 1955. The Ramsdell Theatre was listed on the National Register for Historic Places in 1972, and many improvements were made in the 1980s, thanks to grant monies and donations. James Earl Jones himself has returned to the area twice to help raise funds. 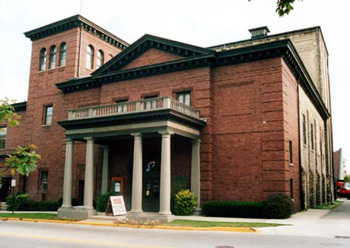 Today, the Ramsdell Theatre is a cultural center in West Michigan, and plays an integral part in Manistee's history. It is the home for the Manistee Civic Players' productions--and hosts ballet performances, art exhibits, proms, weddings, and other special events. It opens its doors for public tours on specified dates in the summer. Visit their website, Ramsdell-theater.org for more information.